Discussion in 'General Freemasonry Discussion' started by RJS, Jan 21, 2009. Does anyone know why decorated aprons are no longer worn? I'd love to have a decorated apron. It's amazing how much work went into the Aprons years ago. Beautiful tube brother Blake thanks for the photo, but tubs are hard on the aprons, after a time you cannot make them lay flat. Use caution. Texas has never been much for the... decorated aprons. Other than GL officers and PM I dont know of any Texas Aprons (notice they are a different size than most?). The only exception being that of the Lodge of Research, which I hope to some day be the proud owner of! Short answer is you have to become a FULL member of the Lodge of Research. To do that you have to submit a paper, have it approved, and present the paper before the Lodge of Research and it will then be published. After you are a full member you get to wear the apron. VERY prestigious to have one, and I dont think there are that many around. You can get all the details at http://www.gower.net/Community/tlr/ and see what the apron looks like! Brad, where did you get your avatar? I see some possibilities for some new ink in there! well dang I cant find it, was hoping to find a bigger rendition to give my ink artist (who is a Brother MM and does outstanding work). Actually I havent used him yet but every tatt Ive seen that he as done is outstanding! I have a local ink slinger I use for most of mine, but for my masonic ink I want a Brother to do it. I think they understand the importance more and will do a better job knowing how important it is. Speaking of "bespangled" aprons (the correct term for them), Frontier Lodge has a special dispensation to wear them. I'm currently working on mine right now, based partly off an apron that Forrest Lodge has hanging on the wall. Aren't these a bit undersized for use in Texas? I was under the impression that the apron size in Texas was 16 x 16. I feel like I read somewhere that only a PM can have a decorated apron. Will someone clarify what my memory is telling me? 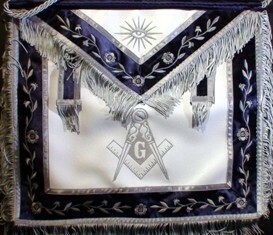 They can I have a PM in my Lodge who has an apron very similar to the above pic. I'm fairly certain you are correct. Too bad though, I would like to see decorated aprons come back. I ran across a great web site from the other side of the pond that had some really nice lambskin aprons, most were remakes like the Washington/Lafayette Apron. I will find the link and post it later. They had some other neat looking items as well. The Article is way to long but I will hit the points we need here. It details the decoration of an apron and leaves nothing to question. Art 273 Officers: Regalia: Apron shall be 16 inches square with a drop in the bib of 6 inches to the triangular point. Only the bib shall have the jewel of the appropriate officer embroidered on it and the body below the bib may have the S&C circumcribing the letter G . The outside edge may have a 1 inch blue strip around the outside. The bib can have the same blue strip just 1/2 inch wide. Past Masters may wear the same apron as the WM but with the addition of the arch (or quadrant) under the points of the compasses would be optional.